This year, for my birthday, I got some money from family, and I've been hoarding it, spending it in little bits here and there. 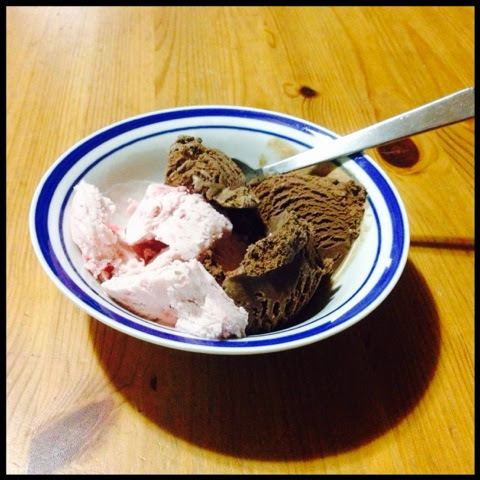 A couple of weeks ago I spent a good chunk on a lovely red ice cream maker and I love, love, love it. Scout and I have been making ice cream, a lot. We've made the strawberry (twice), chocolate, and peanut butter cup recipes from the booklet, and Taylor's recipe for chocolate coconut with Oreo cookies (amazing!). Scout and I found a few funfetti cake batter recipes today, I want to try one of them next. I'm on the hunt for more recipes, ideas?